Fairchild license produced Fokker's F27 as the F-27 in the USA (in fact the F-27 flew first) and independently of Fokker it decided to produce a stretched version of the F-27. This was called the FH-227 and first flew in January 1966. Stretching the fuselage by 1.83 metres enabled standard seating to increase to 56 passengers. Fairchild sold 78 of the new FH-227 and the type has had a good length of service often finding second operators with military operators. In 1:400 the FH-227 is quite an obscure type and we're lucky to have it at all, thanks as usual with obscure moulds, to Aeroclassics. 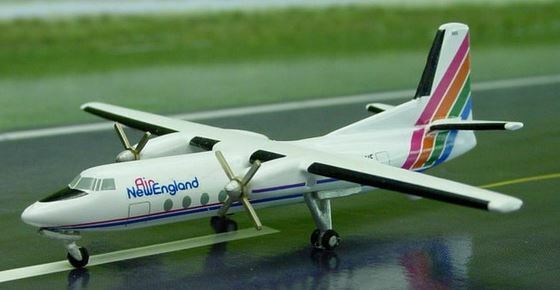 In fact way back in 2001 Aeroclassics had created an FH-227 mould though it only saw one actual release (Air New England) and this only had 100 pieces made. Three other, decaled, models were produced in very small numbers but not actually released. The old mould shows its age and probably isn't using the correct proportions. It doesn't matter much as its rare as rokcing horse sh*t nowadays anyway.